Hurricanes…earthquakes…tornadoes…flood zones…storm surge…winter blizzards. With locations all over the country, Arrowhead offices are susceptible to Mother Nature and her arsenal of weather weapons. Save this emergency hotline number now to your mobile phone, so that you're prepared for the next office disruption. This hotline will let you know real-time about office closures/openings, etc. in all time zones. September was Disaster Preparedness month, and ironically was also one of the worst months for disasters in recent Arrowhead history. First it was Hurricane Harvey, chewing up the Gulf Coast along Texas and Louisiana, bringing record-breaking rain (an entire year’s worth) in just a day or two. One of Jackie Miller’s prime producers for the Manufactured Housing Program, Kurt Kelley of Mobile Insurance in Houston, had to close his office because roads were impassable. Luckily none of his staff was injured or sustained major damage, so they could quickly respond to their insureds’ frantic calls. 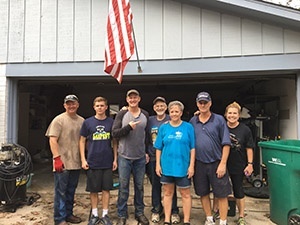 helps Houston friends clean up after Harvey. Our ACM office in Tampa was busily handling Hurricane Harvey claims, but had to quickly close up shop when Hurricane Irma struck. 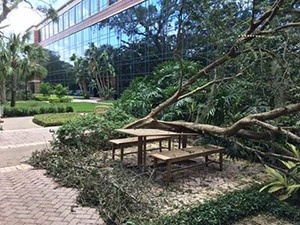 At right: Tampa office after Irma. ACM's office is in far left lower corner. She called hotels in Georgia, North Carolina, Tennessee and Alabama – all were full. Finally reserving a room in Huntsville, Alabama, they stuffed their escape vehicle completely full and set off on what would normally be a 10-hour drive, but took 26 hours. “In a caravan with friends, we drove through the night. When we needed gas, there was none.” Luckily, a friend told her about the Gas Buddy app, which located gas at a station 80 miles away. “It was a roll of the dice as to whether they’d still have gas when we got there – and they did,” she recalled. Calling around, they located cans 180 miles away at an auto parts store. They bought cans of all sizes to hold enough gas for the trip home, which was 27 hours straight. 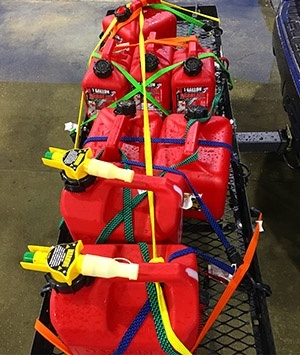 At right: Nicolle's traveling "car bomb"
The good thing about hurricanes, says Teresa Heller, ACM director of property claims, is that you see them coming and have time to prepare. The bad thing is that the storm seems to approach in slow motion, making the wait agonizingly stressful. Although Teresa moved to Florida in 1980, Hurricane Irma was the first time she evacuated. “I practically live on Tampa Bay; flood risk is our big concern.” They started preparing a week before the storm hit. First on the list: buy 40 gallons of fuel, “because we knew there would be a run on the pumps.” Sure enough, by Thursday stations were running out of gas. Perishables were in short supply. Also gone was plywood to board up windows and generators. Ironically, the storm was still hundreds of miles away and the sun shining. Empty the refrigerator. If the power goes out, food will spoil and ruin your fridge. Turn off the power. Unexpected power surge can damage electronics. Turn off the main water. Remove everything from the yard. Otherwise, it becomes flying projectiles. Remove any keepsakes you cannot live without. Fill six 5-gallon water jugs to ensure potable water and also for use to flush the toilets if water’s not available or usable after the storm. Teresa and her husband evacuated to downtown Orlando, to her brother’s 11th floor condo. The clouds and wind had already started to move in. Then the waiting starts. Dhara’s also been working with ICA to help them recruit a multitude of field adjusters. ICA is another claims service provider that’s part of Brown & Brown’s National Programs. “Where ACM only had a few thousand claims, ICA has had tens of thousands of claims, and they’re desperate for adjusters,” she explained. We also checked in with our new Sun Prairie, WI office. While hurricanes aren’t a problem, winter storms can be. We talked with Tiffany Poletti, VP of operations & underwriting initiatives for Core Commercial, about their experiences with winter storms and their snow emergency plan. What typically constitutes a “bad weather day”? Whether it’s hurricanes and flooding along the East and Gulf coasts, tornadoes in the Midwest or earthquakes and fires along the West Coast, it pays to be prepared. You can start by saving our emergency line to your mobile right now.